An Introduction to Biblical Ethics (henceforth, IBE) is part of the “B&H Studies in Christian Ethics.” Author David Jones bolsters an already successful series with a look at biblical ethics and its daily practice in the Christian life. Written for college student and “motivated laymen” (xiv), IBE wonderfully articulates positions, definitions, and Scriptural interpretation. Jones starts IBE with an extremely helpful introduction chapter. 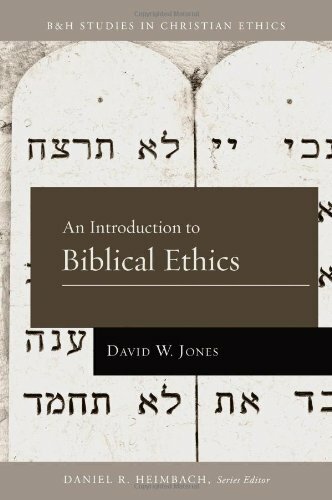 Presuming no prior experience with ethics, Jones breaks down the field in general before moving to the detailed approach of biblical ethics. He defines biblical ethics as “the attempt to understand what it means both to live and to think biblically” (6). There are qualifications on ethical systems (7-13) and the differences between conduct, character, and goals (20-26). This introduction establishes the Scripture-focused baseline for Jones’ work. The remainder of the book is divided in talking about the law in general (chapter 2-6) and the Ten Commandments specifically (chapter 7-8). Jones takes a position on God’s revealed law that walks a fine historical line. There are important qualifications about the law and historical Christian positions in the chapters titled “The Relevancy of the Law” (chapter 4) and “The Coherency of the Law” (chapter 5). The theologies of theonomy, antinomianism, and Luther are evaluated with strengths and weaknesses described. Oversimplifications and misconceptions are dissolved on every page. Jones’ position falls along a strong Reformed perspective which permits some phenomenal assertions such as “to suppress knowledge of God’s attributes is tantamount to breaking the law” (50) and “Indeed, the gospel is no less comprehensive that the fall, which affected all areas of life” (64). God’s revealed law is highly praised throughout IBE by Jones. The final two chapters of IBE are dedicated to walking through the Ten Commandments (chapter 7-8). These chapters are good introductions to the Commandments. However, they do not add anything of significance to the reformation confessions and catechisms. In some areas, Luther’s Catechism as well as the Westminster Standards provide more practical introduction to the Ten Commandments in everyday Christian living. However, Jones lays a groundwork that makes those documents more accessible. In conclusion, An Introduction to Biblical Ethics makes for a good “text book” read. It contains review/discussion questions at the conclusion of each chapter. Individuals seeking a glossary understanding on the major issues and differing interpretations will benefit from it. Churches interested in Bible Study or Sunday School material will love the format, discussion questions, and overall tone of the David Jones.